We are manufacturing various metal products such as industrial hand tools, automobile repairing tools, bolts, nuts, screws etc. with 5-die-station formers. FLAG has been our original world-wide brand since 2002 that registered not only in Japan but in Republic of China and Taiwan. We can offer any kind of products corresponding to user's request on demand, in design, polishing, packaging at our ISO 9001:2008 registered factory. Until length 110, outer diameter 28, outer size 42 is acceptable with cold-forged former, and until length 135 outer size 36 is acceptable with cold-forged press. We will reply all your respective desire of polishing, stamping with die, packing and shipping. Thank you very much for using Flag Brand products. We’re receiving many enquiries about 3/8” (9.5mm) Diamond-cut socket, around which has 12 sides-shape-cutted. We are sorry but The sizes of 21mm, 22mm, 24mm are completed. Concerning of 20mm&23mm, the sale ends when all the stock has been sold. Other sizes are still available for you to purchase. Instead of “Diamond-cut socket”, we have a large assortment in stock “Standard series socket” We are waiting for your order from the heart. Information: We newly started to produce hand-tools for professional builders. We hope to deliver those tools with user-friendly and high quality, high cost performanc. Power press machine Annual specific inspection. We move into a new office room. Factory inspection by fire department. Centerless grinding machine partial overhauled. A new custom-made automatic hydraulic marking press machine equipped. Auto-blower installed on a single function cutting machine. Packing space's Layout changed (3F). Centerless grinding machine parts replacement repaired. 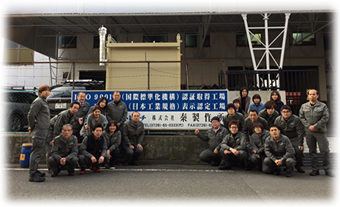 TOYOTA Forklift Annual inspection was executed.